The Civil War was one of the most terrible conflicts in our nation's history and had repercussions for years after it ended. While many people know about the major battles, few know of the many roles that women played during the war. Women took over for the men who went away to war by running farms and businesses. In this book, Karen Abbott introduces us to four fascinating women who took on men's roles and became soldiers and spies. Ms. Abbott has written a wonderful book that brings history to vivid life. She manage to write about both sides without elevating one and condemning the other. We meet two women who support the Confederacy and two who fight for the Union. Belle Boyd becomes a spy for the Confederacy after the Union invades her hometown and Rose O'Neal Greenhow romanced Union generals in order to gain information. Emma Edmonds masquerades as a man to fight for the Union and Elizabeth Van Lew smuggles soldiers out of Confederate prisons and sends them back North. There is a lot of history to take in from these pages. We meet soldiers and generals, presidents and slaves, and move from The White House to cities under siege and bloody battle fields. While readers jump back and forth between the women, she moves in chronological order. By laying out the book this way, Abbott is able to show connections between these very different women. I know a fair deal about the Civil War because of a great teacher in high school. Even if you don't consider yourself a Civil War buff, this book makes it easy to follow along. The focus is on the women and their stories, not memorizing dates and locations. While you may not agree with many of the tactics or the motives of these women, their commitment and intelligence are admirable. They were women in a time when women were seen as second class citizens. Belle, Rose, Emma, and Elizabeth used their smarts, their feminine wiles, and even the perception that they were weak and stupid to gain information for their cause. 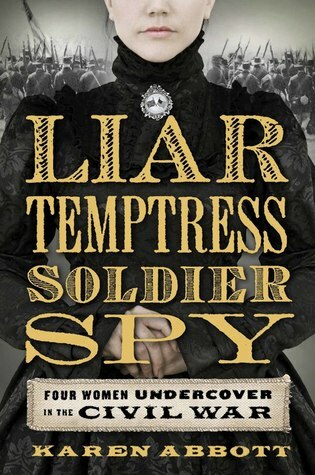 Liar, Temptress, Soldier, Spy is a perfect pick for the reader who loves history or learning about remarkable women. Need to know more about Liar, Temptress, Soldier, Spy? Check out other reviews at the TLC Book Tours page. I just finished a Civil War era book based on true events, so this is definitely now on my radar. I'm glad you enjoyed it, and glad to hear the author unravels the info in an easy to follow style. It's interesting how there seem to be popular topics in historical fiction/non-fiction as well as general and YA fiction. There are always a ton of books set around WWII, but the Civil War era seems to be really popular right now! I am totally going to have to check this out! This sounds interesting! It's similar to how women worked men's roles here during WW1, and that led to votes for women. Indeed! Although the after-the-war part was not so cheery for these women. As a whole, they fell into obscurity and some of them even spent time in an asylum. Never underestimate a woman, that's for sure! I'm looking forward to learning about these fascinating women. I loved this book! I agree that the author did a great job making this accessible by focusing on the story rather without getting bogged down in dates and places. Plus, they were such fascinating stories. I wish we learned more about the role women played in the civil war in school because I had no idea. Right?!? I had a great teacher for the Civil War period, but there are so many people's stories that don't get told!